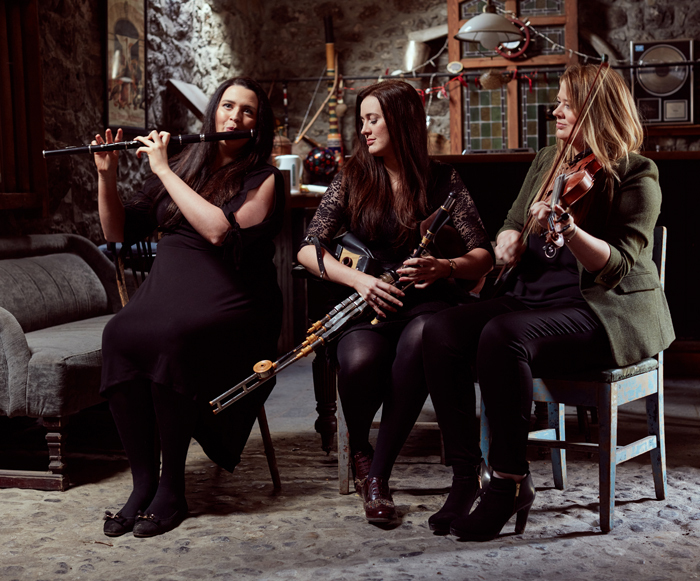 The Friel Sisters, Anna, Sheila and Clare Friel are young traditional musicians born and brought up in Glasgow with their family roots firmly entrenched in the Donegal Gaeltacht. They play a mixture of music interspersed with songs in English and Irish, many from their family repertoire. Being siblings, they achieve a close blend on fiddle, flute and uilleann pipes. Since the launch of their debut album, they have performed in various venues and festivals across Europe, America and Asia and have appeared as guests on stage or toured with acts such as Altan, The Chieftains, Lúnasa, Sharon Shannon, The Máirtín O’Connor Trio, Cherish the Ladies and Solas. In 2016, the girls performed at Festival Interceltique de Lorient, and won the prestigious Trophée Loïc Raison for best band of the festival. 2017 was a very exciting time for the girls as they recorded and prepared for release of their new album ‘Before the Sun’ with Hajime Takahashi and Cathal Ó Curráin, produced by Ciarán Ó Maonaigh and recorded by Jack Talty. This was launched at Scoil Gheimhridh Ghaoth Dobhair, in Donegal in December 2017 and at their sold out Celtic Connections gig in January 2018. Since it’s release, ‘Before the Sun’ has been very well received, getting 4 stars in the Irish Times and a lot of airplay including being played on RTE 1’s ‘The Rolling Wave’ as part of International Women’s Day. In February 2018, Clare received TG4 Gradam Ceoil Ceoiltóir Óg/Young Musician of the Year 2018. The awards concert was held in the Waterfront in Belfast, where she played solo and with Anna, Sheila and Cathal Ó Curráin to an amazing audience, including the Irish President Michael D. Higgins. She was completely honoured to receive this, and to be amongst an incredible list of winners for this year. She is the first person in Scotland to receive this award.